It's never easy to separate squirrels from access to birdseed, but with a trial-and-error approach to these simple tips, you can likely find a solution that works for your yard. 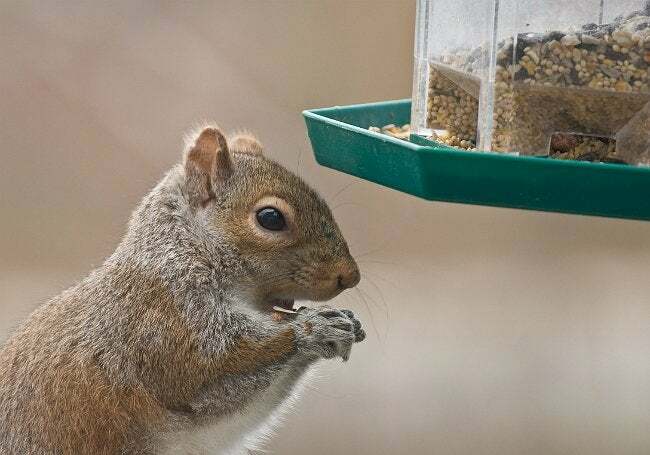 What’s the best way to keep those persistent squirrels from pigging out at your bird feeder? Here’s an assortment of tactics well worth trying. First, make sure the feeder is in a location that’s good for the birds but bad for the squirrels. Squirrels can manage ten-foot horizontal leaps with no sweat, so the ideal feeder location is away from roofs, porches, trees or utility wires. Make sure to prune any trees that are within launching distance. And if you can, mount the feeder on a smooth metal pole at least ten feet high and away from any trees or structures. No matter where you position the feeder, consider adding smooth plastic baffles both below the feeder and above it. The most effective baffles are designed to tilt and twirl if a squirrel hops aboard. You might also try enclosing the feeder in metal fencing whose mesh is large enough to allow birds in, small enough to keep furry critters out. One more weapon in your arsenal: Mix cayenne pepper in with your birdseed. Squirrels can’t take the heat, but birds don’t seem to mind.